If the Toronto Blue Jays look a little sluggish during their upcoming series with the Detroit Tigers, you can blame the U.S. Department of Transportation. In August, the agency banned Canadian charter flight companies from making multiple flights within the United States without first returning to Canada. Our neighbors to the north responded with a similar ban on American charters, like the one used by the Blue Jays. That means the Jays may have to take a bus trip to Detroit, which actually violates a MLB Players Association rule about bus trips longer than 200 miles, or take a bus to Buffalo and then fly from there to Detroit. If the ban continues into next season they'd have to make that trip at the front end of every road trip, a mild inconvenience that would seem to make it obvious that this shouting match between countries should have a more reasonable resolution. The Jays' saga will play out this weekend, but if there's no settlement to this ban the NHL could find themselves in a tough spot when their season gets underway next month. With six Canadian teams, road trips for clubs on both sides of the border are going to be made unduly difficult because of the late change in the rules and their existing contracts with charter companies. "It's potentially a very significant impact," NHL Deputy Commisioner Bill Daly said. "It's crazy and very destabilizing to our business. We're operating on a long-standing interpretation and for it to change overnight on the eve of our season is creating a huge problem for us." Foreign airlines have long been banned from flying between U.S. cities because of the feat that they will undercut the prices of American carriers, but there was an exemption in place allowing sports teams, musical tours and the like to fly from city to city. 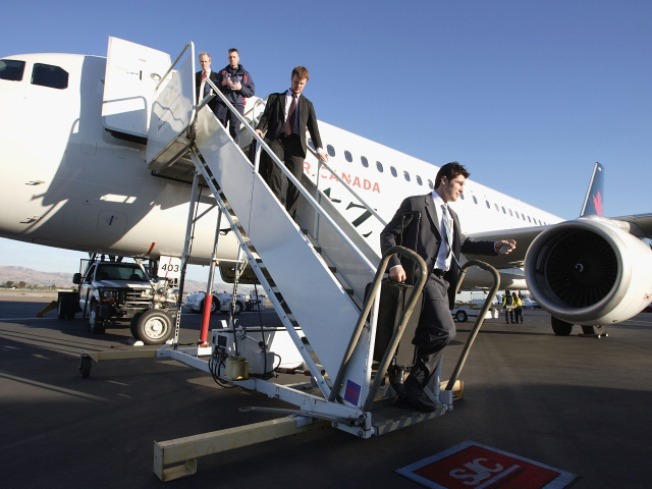 An American pilots group complained that Air Canada, operating the charter for hockey teams, would pick up passengers not on the initial flights, which has the too cool for what is name of cabotage, and then transport them from Chicago to Dallas, say, which violates the exemption. Now, let's say that a team plays a game in Toronto one night and sees one of their centers injured. They leave following the game, but not before sending word to the minor leagues to send a player up to take his spot when the team plays in Chicago. When the team then goes on to Dallas, there's a new person on the plane and, presto, you've violated the law. It all seems incredibly silly, especially since there was no point to the exemption in the first place if there were no allowances made for the vagaries of a sports team's traveling party. That would seem to point to a quick, sensible solution to the problem that made people on both sides of the party happy, but when governments get involved that can be difficult to impossible to pull off. Especially when one of the governments seemed to time the enaction of new rules specifically to monkey with the start of the season for Canada's national pastime. Long story short, betting on road teams in games between Canadian and American teams this hockey season may not be the wisest investment.